Fresh off my trip from Nashville & Louisville and ready to recap some of my burger eating action. My two competitors are Burger Up (Nashville) and Harvest (Louisville). Both restaurants focus on local farming, community and sustainability, but Burger Up’s primary focus is burgers (duh) while Harvest encompasses all aspects of farm goods & seasonal ingredients. First up, Burger up: Since I was in the South, I opted for a burger topped with one of their classic staples, pimento cheese. 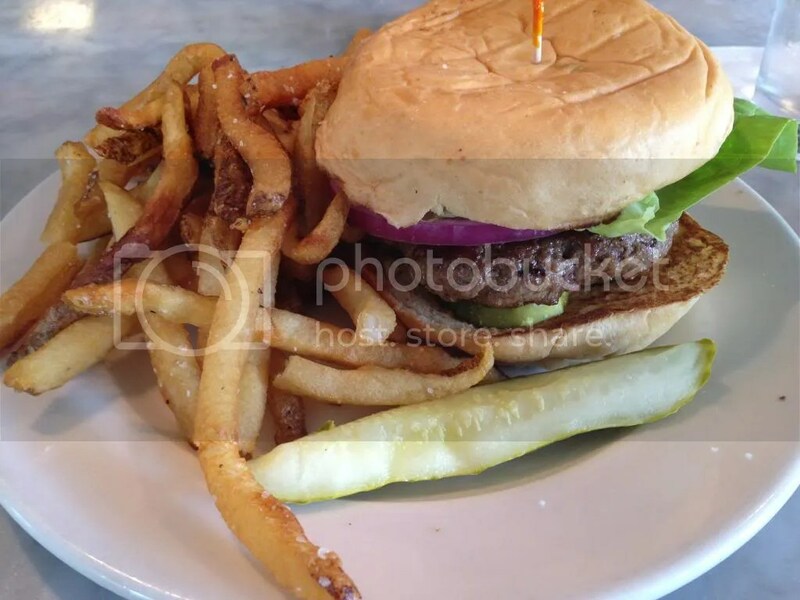 The “Ramsey Pimento burger” comes topped with house made pimento cheese, pickles, red onion, and bibb lettuce. I ordered and wasn’t asked how I wanted my burger cooked; it came out on the medium-well side, slightly juicy but without any pink. I’d never had pimento cheese before because it looked gross, but it had a nice flavor. The bun was a plain hamburger bun and had a good ratio to the burger patty. There were a lot of pickles on the bottom of the burger and it came with a pickle spear. I love pickles so this was perfect! Burger Up also makes their own ketchup in house, so putting some of that on the burger gave it a good sweetness. Some house made ketchup winds up tasting too much like marinara sauce, but this was perfect. 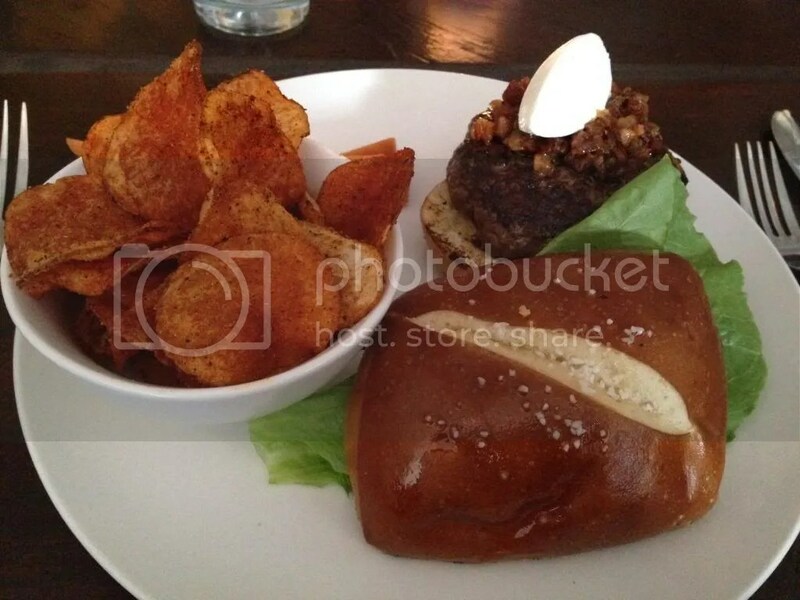 Next, Harvest: Their burger was topped with chevre, hog jowl bacon jam, and lettuce and it was on a pretzel bun! I love pretzel buns, so I just had to have it. I ordered my burger medium; it came out somewhere between medium & medium-well (half of the burger was more pink than the other). The burger was juicy and delicious. The bun was nice and soft. The chevre paired really well, giving it a cool, fresh flavor. I’d never thought to put goat cheese on a burger before, but I really enjoyed it. The hog jowl bacon jam was tasty as well. One of our appetizers had beer cheese, so I also saved some of that and put it on the burger (because what goes better with pretzels than cheese? ); it gave it a little extra cheesiness which I thoroughly enjoyed. So, who was the winner? It was a tough call, but in the end neither of them won because I also ate a burger at Husk in Nashville which trumped them both and was quite possibly the best burger I’ve had all year! The burger is two thin patties of Double H Farms Beef, topped with gooey American cheese under a delicious house-made sesame bun. Despite the thinness of the patties, they were cooked perfectly medium. Between the cheese, the juiciness of the patties and the softness of the bun, this trumps any double stacked fast food burger you’ve ever had. It was so amazing, I seriously thought about ordering another. 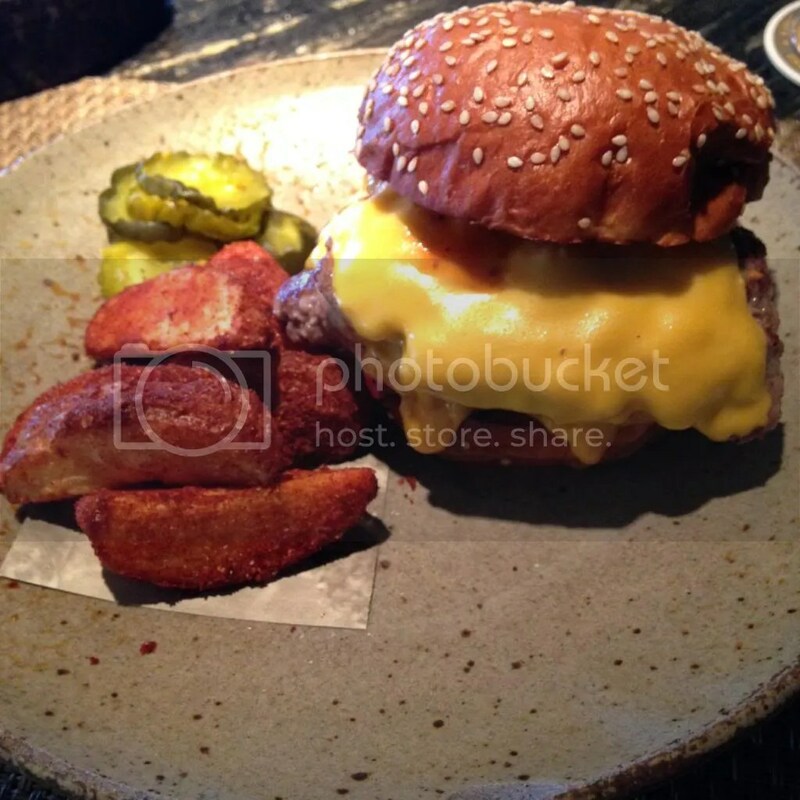 If you find yourself in Nashville (or even at Husk’s sister restaurant in Charleston), make sure you stop in to Husk during lunch time, as this is the only time the burger is offered. It may quite possibly ruin any other burger you ever eat. Posted in bacon jam, buns, burger, burger throwdown, Burger Up, burgers, cheese, chevre, Harvest, Husk, Louisville, Nashville, pickles, pimento, pretzel. Bookmark the permalink.